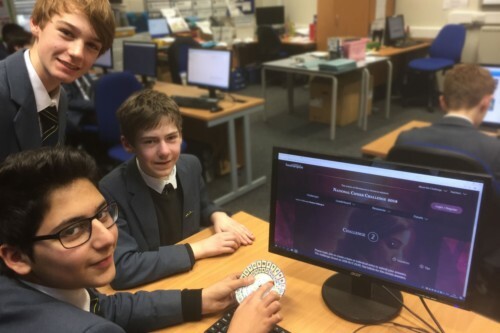 Congratulations to the members of code-cracking team “Dirk Bale’s Holistic Detective Agency” who competed in the Southampton University Cipher Challenge. The team wrestled with a variety of coded messages using ciphers that ranged from simple Caesar encoding through to a brain-bending keyed Vigenere cipher. The team came joint first in the ‘A’ challenge rounds and joint eleventh from a pool of over 2000 teams on points in the time-constrained ‘B’ challenge section. The students developed some strong code-cracking skills through a series of increasingly challenging rounds and have programmed useful decoding tools that will make future cipher competitions easier to tackle. Hopefully these will be put through their paces in the Manchester University “Alan Turing Cryptography Competition” that starts on Monday 28th January. Any student in S1 to S5 who wants to take part should see Mr Morton to set up or join a team. Good luck to the dozens of lower school students who have already signed up to a team.